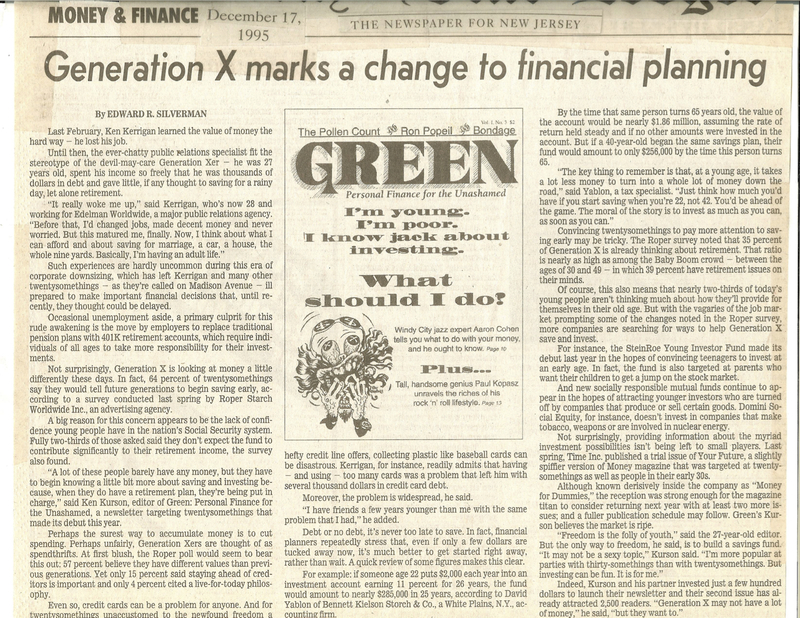 A few years before Tony Soprano was memorably filmed picking the Star-Ledger off his driveway in his bathrobe and undershorts, New Jersey’s largest paper ran a rather lengthy profile of Green. It featured an image of the cover of Green #3 with Pat Redding’s classic drawing of a guy freaking out about his finances. It was confusing that this story started out with a character called Ken Kerrigan who was 27 — exactly the same as Ken Kurson from Green who was then 27. But New Jersey readers are apparently smart enough to hold the concept of two different 27-year-old Ken Ks.